If the United States had a formal classification of estates, Ridge would be the equivalent of a First Growth. Since the late 1960s, Ridge has produced world-class wines that can compete with the best from anywhere. Longtime winemaker Paul Draper recently announced his retirement from Ridge after a storied career during which he has become one of the most eloquent ambassadors of American wine this country has ever seen. 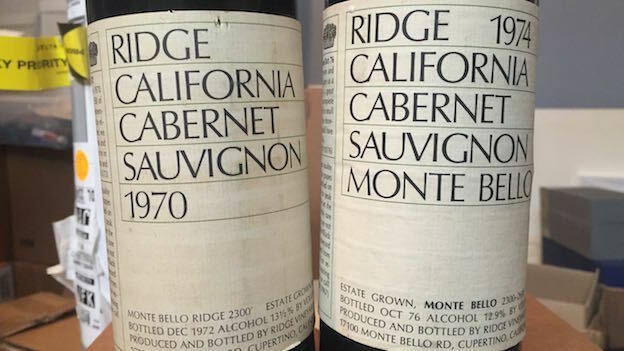 Readers who want to learn more about Draper's history at Ridge may want to revisit my article Ridge Monte Bello: Past, Present and Future published last year. I tasted a number of the wines in this article with Draper and his team, including winemaker Eric Baugher, vineyard manager David Gates and newly-appointed CEO Mark Vernon last fall in New York during what felt very much like a farewell tour for Draper, although it was not announced as such. 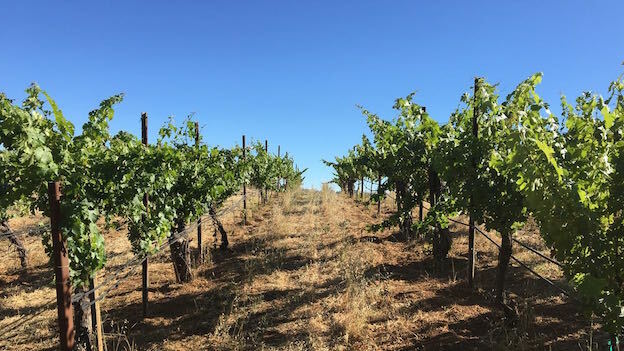 Ridge’s long-term organizational stability and the transition to the new team, which I have been able to watch unfold over many years, stands in stark contrast to the norm in California, where winemakers, vineyard managers and executives change jobs every few years. Of course, since 1986 Ridge has been owned by Otsuka Pharmaceutical of Japan, where business plans often span a hundred years or more. I also had a chance to taste a few older vintages during two visits to the property earlier this year. The 1970 and 1974 were both from my cellar. 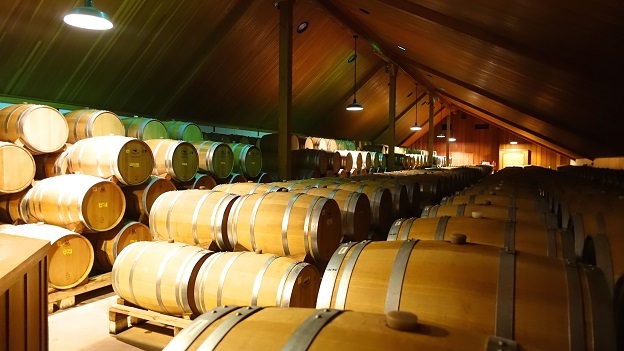 For several decades Ridge has represented the values of traditional, non-interventionalist winemaking, which Draper describes as basically doing nothing. Of course, it is not as simple as that. One of the attributes of Monte Bello is its ability to ripen fruit that gives birth to intense, ageworthy wines at relatively low alcohols. Only once has Monte Bello surpassed 14% alcohol (2001), and while I personally do not put much stock in a single metric as a measure of quality, Draper’s pursuit of what can be described as a more classic, lower alcohol style is no doubt a big part of the legacy he leaves to the current team. 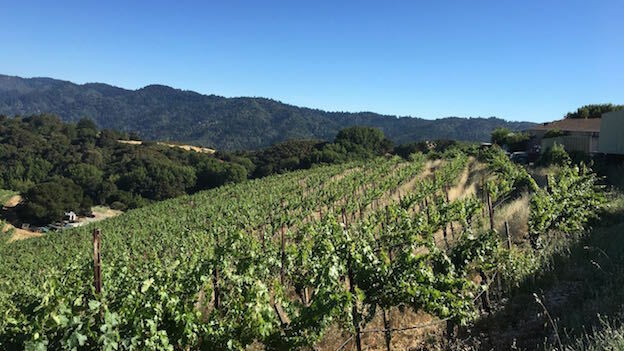 One of the shifts over the last 20 years or so has been a transition from Ozark oak, which was used predominantly through 1995, to Appalachian oak, which became dominant around 2005 and now constitutes virtually all the oak used in the Monte Bello. Baugher describes Ozark oak as having more spicy and herbaceous signatures and Appalachian oak as sweeter and more exotic. Tasting the 1995 and 2005 side-by-side makes for an interesting comparison of the influence of cooperage. The 2012 is a racy, voluptuous Monte Bello built on a core of sweet red fruit, with striking perfume, silky tannins and fabulous overall balance. The 2012 is of course an infant, and the new oak is still evident. As Vinous readers know, Monte Bello is a wine that really should not be touched until its tenth birthday, and even that requires an optimistic view. The 2012 has been a consistently brilliant wine. Today, it is once again stellar. A dark, brooding beauty, the 2006 Monte Bello is still very, very young. The aromatics alone are enticing, but the tannins still need time to soften. The 2006 is a masculine, vertical Monte Bello that demands cellaring. Even so, it is pretty impressive today. Scents of lavender, sage, mint and savory herbs add closing flourishes. The perfumed sweetness of the fruit - one of the hallmarks of the very late harvest - remains one of the signatures of the 2006. The 2006 can be enjoyed today or cellared for another 25+ years. 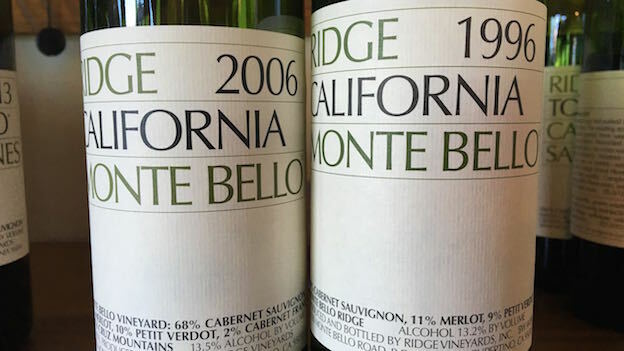 The 2005 Monte Bello is beginning to show the first signs of aromatic development, although it has more than enough depth and density to drink well for another twenty years. Tobacco, cedar, leather, spice and menthol add considerable nuance. The tannins are nicely resolved, which makes the 2005 an excellent choice for current drinking. The 2005 is not a blockbuster, but it is super-polished and refined, with an almost exotic sense of ripeness from the warm, dry summer and low yields of that year. The 2002 Monte Bello is just staring to enter the early plateau of its maturity. Bright red cherry, raspberry, wild flowers, mint and crushed flowers all lift from the glass. Sweet, perfumed and totally gracious, the 2002 has it all going on today. The 2002 is an especially silky, nuanced and feminine Monte Bello, particularly in its aromatics, although it turns sweeter and more unctuous on the mid-palate. There is plenty of depth and intensity, but it is all about understatement when it comes to the 2002, a compelling, racy Monte Bello that is in a great place today. Eric Baugher describes 2002 as a vintage with the lowest yields seen in the last 20 years because of bad weather during bloom. Macerations were shorter than normal because of the inherent richness of the fruit. 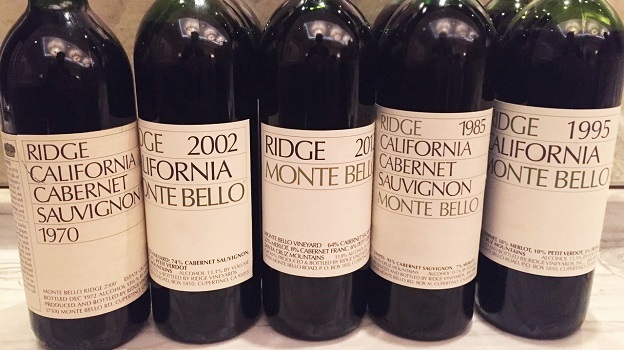 Ridge's 1996 Monte Bello is an absolute stunner. The bouquet evokes a top Left Bank Bordeaux in a great vintage. Not surprisingly, the Cabernet Sauvignon in the 1996 is very high at 80%. Every bit as compelling on the palate, the 1996 simply exudes class. I am not sure words alone can capture just how vivid the wine is at twenty years of age. Graphite, smoke, tobacco, licorice and a core of dark fruit unfold on the palate as the 1996 shows off its pedigree. Readers lucky enough to own it can look forward to another two decades plus of exceptional drinking. The 1996 is an uber-classic, Médoc-leaning Monte Bello. What a wine! The 1995 Monte Bello is powerful, bright and incisive. At twenty years of age, the 1995 retains gorgeous, refreshing acidity that gives the wine lift and energy. The 1995 is a brooding Monte Bello, with darker tonalities of fruit and accompanying notes of smoke, licorice, spice, menthol, tobacco and cedar. Although the 1995 is striking today, it could also use more time in bottle, as it remains a touch compact and austere, especially next to the 2012 and 2002 tasted alongside it. Readers who enjoy cool, mineral and savory inflected Cabernets will adore the 1995, a wine that will drink well for another 20 years. Vineyard manager David Gates describes 1995 as a cool, relaxed, late ripening season that yielded small berries with elevated tannins. A second recent bottle was a bit more open and ample. Either way, the 1995 Monte Bello is a remarkably vivid, expressive wine that has a long life ahead of it. The 1985 Cabernet Sauvignon Monte Bello is a gorgeous wine to drink now, as the aromatics are fully developed, the tannins have softened, and all the elements are impeccably balanced throughout. Crushed flowers, orange peel, new leather, tobacco, mint and dried cherries are some of the scents that lift from the glass. Sensual, silky and refined, the 1985 has a lot to offer today, and should continue to drink well for at least another decade, as it preserves quite a bit of depth for a wine of its age. My own preference leans towards aged wines with a bit more freshness, but two recent bottles have shown the 1985 to be in fine shape. Paul Draper and Eric Baugher describe 1985 as a classic, structured vintage with a cool spring, late bloom, mild dry summer and no real issues, which came as a relief after the much more challenging 1984. The 1985 was aged in 60% new American oak. The 1978 Cabernet Sauvignon Monte Bello is exotic, sweet, perfumed and layered, with an almost liqueur-like richness, but no sense of heaviness at all. Hard candy, wild flowers, cinnamon and mint give the wine much of its eccentric, wild personality. In 1978, the malos did not fully finish in barrel. Ridge bottled the wine anyway with a trace of malic acid, only to find the wine bubbling in bottle. All of the bottles were uncorked, the wine finished its malo and was subsequently rebottled. A portion of the wine was never sold, which is why some stock remains today. Paul Draper explains that at the outset, everyone at Ridge thought the wine was not particularly of note and that it would not age. Well, the 1978 has aged just fine, even if its not one of the truly great Monte Bellos. I have been fortunate to drink the 1974 Monte Bello three times in the last year. I served this bottle, from my cellar, blind to a group of hard-core Francophiles at the end of a dinner that showcased the best of Burgundy and Bordeaux. Every person in the room thought the wine was Bordeaux. No one came close to guessing California, much less identifying the age of the wine or the vintage. When the 1974 Monte Bello was revealed, there was only silence at the table. Tasted from a perfect bottle, the 1974 remains almost unnaturally deep, powerful and intense. It is an eternal wine whose life will only be determined by how well corks hold up. Put simply, the 1974 Monte Bello is one of the greatest and most singular wines I have ever tasted from anywhere in the world. The 1970 Cabernet Sauvignon is a distinctly ferrous, savory wine. Iron, cedar, tobacco, herbs, dried cherries, game and smoke are some of the signatures. Deep, powerful and explosive, this super-classic, old school Cabernet Sauvignon is simply fabulous. The 1970 is a decidedly rustic, burly Monte Bello, but it is also fascinating to taste from a historical perspective. With time in the glass, the 1970 gets better and better, even if this is not the most pristine example I have tasted. 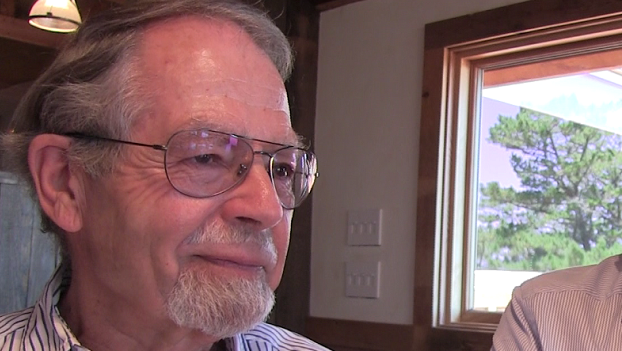 Ridge's longtime vineyard manager David Gates adds that Paul Draper initially wanted the 1970 to be served at the Judgment of Paris, and that if it had been, it would have won. Steven Spurrier ultimately chose the 1971, and Ridge placed fifth. The 1970 needs a lot of air, but once it opens up, it is superb. The 1968 Cabernet Sauvignon is more of a historical curiosity in this tasting, as this is not a pristine bottle. One of the early wines at Ridge, the 1968 was made with the decidedly rustic means available at the time. The wine spent three years in neutral oak barrels and was racking only once every six months, which resulted in an unusually powerful wine. "When the 1968 released it was impossible to drink," says Paul Draper. "Over the years the nose came around, but less so the structure. The 1968 was not pleasant to drink for at least fifteen years." Readers who have an opportunity to buy and cellar Monte Bello should not hesitate to do so. Monte Bello remains one of the most singular and age worthy wines in the world. I was reminded of that time and again during the tastings for this article.